Creative Virtual, a world leader in customer and employee engagement, knowledge management and self-service solutions, is a Gold Sponsor of the upcoming Digital Workplace Directors Forum. Chris Ezekiel, Founder & CEO, will be a featured speaker at the event being held on 30 January 2019 in London. 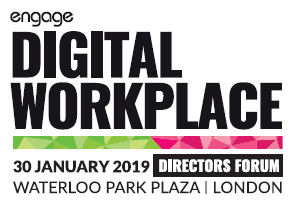 Hosted by Engage Employee, the Digital Workplace Directors Forum will focus on strategies to improve employee engagement, digital workplace solutions and innovations, and tips for creating better employee experiences. Chris will draw on his experience in the industry to outline the essential components for using conversational artificial intelligence (AI) to improve the employee experience. He’ll share live demonstrations and explore best practices for implementing chatbots, virtual agents and live chat to drive better employee engagement. As an event sponsor, Creative Virtual will also be available throughout the day to provide attendees with demonstrations of their award-winning employee support solutions. Designed to be complementary to the systems and processes already in place, V-Person™ virtual agents and chatbots can be easily integrated with Single Sign-On (SSO), ticketing systems and third party databases as well as live chat systems for a personalized, seamless employee experience. For the full event agenda and ticket information, visit the Digital Workplace Directors Forum website.